[136 Pages Report] MarketsandMarkets forecasts the security and vulnerability management market to grow from $5,472.2 million in 2014 to $9,087.4 million in 2019, at a CAGR of 10.7% during the forecast period. Security has become the upmost concern for the companies facing vulnerabilities from various cyber threats to their network infrastructure. The rising investment flows into the global cyber security market guarantees a positive trend in the security and vulnerability management market. The major driving force for the market is the massive movement of enterprises toward cloud technologies. The low costs involved in the cloud infrastructure have led to increasing adoption by enterprises and Small and Medium Businesses (SMBs) around the world. The concerns over cloud security are rapidly on the rise as well. SMBs are showing positive trends with huge investments in the forensics and incident investigation solutions. Vulnerability management solutions are on the rise with the onset of Bring Your Own Device (BYOD) trends in the global corporations. The report defines and segments the security and vulnerability management market into various sub-segments with an in-depth analysis and forecasting of revenues. The report also identifies the factors driving this market, various restraints and opportunities impacting it, along with the technology roadmap and adoption trends. The solutions covered in this report are Security Information and Event Management (SIEM), policy and compliance, forensic and incident investigation solution, device vulnerability, and application vulnerability assessment products and services include consulting, support, and integration. The major players in the security and vulnerability management market included in this report are EMC, HP, IBM, Qualys, Symantec, Microsoft, McAfee, NetIQ, Rapid7, and Tripwire. The increasing growth of cyber-crimes and the associated risks have forced organizations of all sizes to focus more on information security. The vulnerabilities in the IT systems present a big challenge for IT departments and create a need for addressing them, as they are discovered in applications, operating systems, and firmware, as well as in the configurations of key hardware such as printers, switches, and routers. These vulnerabilities if caught early on in their lifecycle can be addressed through various solutions such as applying patches and service suits provided by the software vendors. With the variety of vulnerabilities that exist within an IT environment, vulnerability management has become a critical part of the IT department toolset to aid in identifying, classifying, remediating, and mitigating vulnerabilities, both known and unknown. Vulnerability management is one of the fastest growing segments within the IT security sector, with a predicted 11.3% compounded annual investment growth. This growth is driven by growing concern over compliance and a legal and regulatory need to address security breaches and data loss incidents in the workplace. To manage the growth in security, organizations are turning to security and vulnerability management solutions to provide network intelligence to make security more effective. These solutions covered in this report are Security Information and Event Management (SIEM), policy and compliance, forensic and incident investigation solution, device vulnerability, and application vulnerability assessment products and services, which include consulting, support, and integration. The major players in the security and vulnerability management market included in this report are EMC, HP, IBM, Qualys, Symantec, Microsoft, McAfee, NetIQ, Rapid7, and Tripwire. The report includes an in-depth study of the market trends, market sizing, competitive mapping, and market dynamics. The industry trends, drivers, and opportunities in the security and vulnerability management market distinctly indicate a noteworthy growth in the next 5 years. 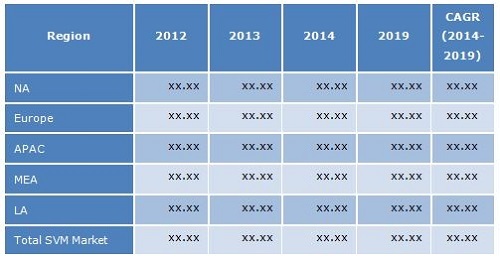 The market is segmented into end users such as Small and Medium Businesses (SMBs) and enterprises; verticals such as BFSI, IT & telecom, government & defense, retail, energy & utilities, healthcare, and others; and regions such as North America (NA), Europe, Asia-Pacific (APAC), Middle East and Africa (MEA), and Latin America (LA). MarketsandMarkets forecasts the security and vulnerability management market to grow from $5,472.2 million in 2014 to $9,087.4 million in 2019, at a CAGR of 10.7% during the forecast period. The overall size of the market equals the sum of revenues of various solutions and services being adopted and subscribed by the end users.